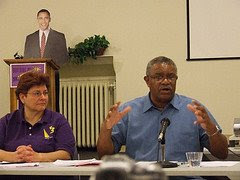 Communist Party USA Number 2 man Jarvis Tyner has been criss-crossing America, rallying party members, converting wavering Democrats and building support for Democratic presidential candidate, Barack Obama. Who was Jarvis Tyner promoting at these meetings? Exactly what kind of "movement" is the Communist Party USA trying to build around Barack Obama? Jarvis Tyner was enormously inspired in his radical activities in the '60s by communist singer and activist Paul Robeson. Coincidentally, Robeson had, in the mid '40s helped persuade a prominent poet (and secret communist)Frank Marshall Davis to move from Chicago to Hawaii. In the late '70s, the poet became a mentor to a young man sent to High School in Hawaii from his home in Indonesia. The question is-to what did Frank Marshall Davis inspire the young Barack Obama?